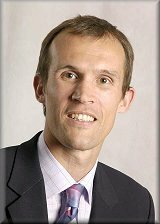 Douglas Dunlop is a Consultant Orthopaedic Surgeon with a special interest in hip surgery. He was appointed to Southampton University Hospital NHS Trust in 2002. His undergraduate training was at UWCM, Cardiff and he trained in Orthopaedic Surgery in Edinburgh. He has fellowships in hip surgery from; The Princess Elizabeth Orthopaedic Centre, Exeter; The Royal Adelaide Hospital; with two travelling fellowships to North America. He has an additional fellowship in complex knee surgery including ligament reconstruction. He uses a variety of implants, both cemented and uncemented and is experienced in less invasive surgical techniques. He is a Fellow of the British Orthopaedic Association and a member of the British Hip Society. He is an Honorary Senior Clinical Lecturer at the University of Southampton and undertakes research on novel materials and stem cells. He is involved in two multicentre trials looking at articulation size and synthetic bone graft. He completed an MD thesis from the University of Edinburgh on bone grafting in hip surgery, based on work in Australia and Edinburgh.